Being efficient and organised also means lacking practice for doing things in the last minute.! To add to that, it's my second nature to be spending a lot, I really mean A LOT, of time thinking through things before I actually start to execute the task. This is mainly to minimise any unforeseen problem/issue further down the track. 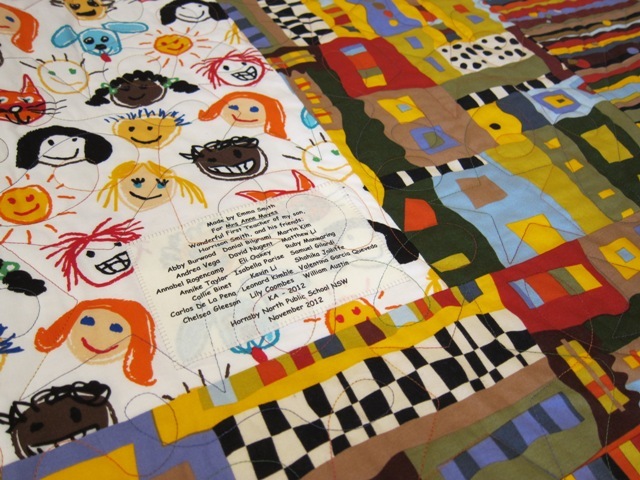 On top of all this, I had some difficulties with 'conceptualising' and choosing a quilt pattern for this particular quilt that I was going to make and have it finished in a short timeframe. It was to be a thank you present for my son's wonderful kindy teacher, Mrs Anne Moyes.! And, what did I do? One morning, while keeping my 'sunshine' company during breakfast time, I drew up a pattern (below) for the quilt (and I think I'm the only person who understands it!). It was also a good chance for me to test out the flying geese ruler by Eleanor Burns. The ruler was excellent and helped saving so much time. 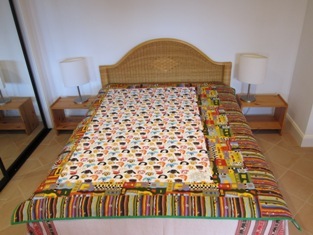 After a few late nights and early mornings, I finished the quilt and was very pleased with it. 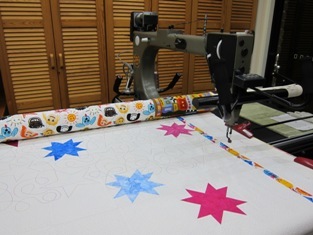 I attached the label on the back of the quilt before machine quilted it. This would make it harder if I were going to have a change of heart.!! I didn't.... 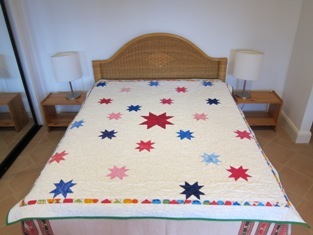 The effort was paid off as the quilt was very well received. I was also touched by the thank you note received from Mrs Moyes. This is the quilt pattern.!! It was about midnight when this photo was taken.! 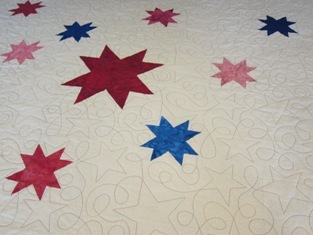 'Stars and Loops' quilting pattern by Linda Taylor complemented the quilt top nicely. 100% Signature variegated cotton, Tie Dye, was used for stitching. 11 pink and 11 blue stars represented 11 beautiful girls and 11 lovely boys in KA class. 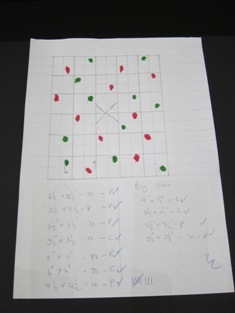 The bigger pink star in the middle represented the teacher, Mrs Moyes. I didn't plan to have the pieced backing but, again, I didn't have enough fabrics, so had to be creative with putting together the backing for the quilt. It was a fun exercise. 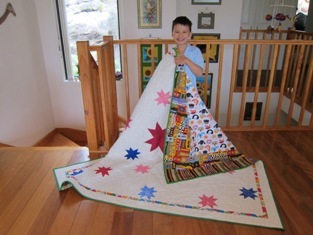 My sunshine and the quilt before it was given away.